Whether you eat Vegan or not, these tasty little frozen dessert bars from So Delicious are an absolutely delicious Weight Watchers treat! Made with coconut milk, they are dairy-free, certified vegan, certified Kosher, certified organic, certified gluten-free and Non-GMO! WOW!! That’s a lot of awesomeness packed into a sweet little frozen dessert! And not only are they creamy and delicious, but they are also just 80 calories per bar and only 2 Points each. This is one dessert you can really feel good about. 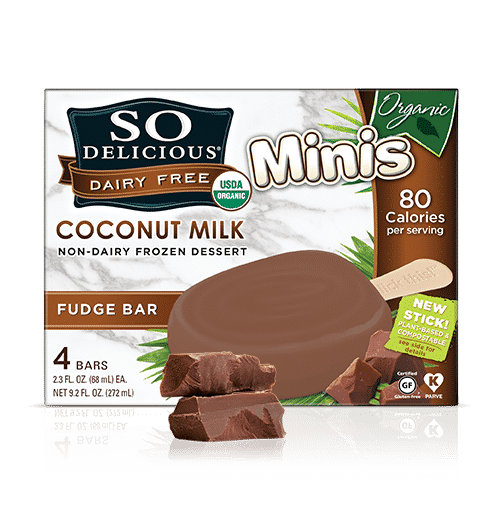 Available in Fudge Bar, Simply Strawberry, and Just Java, So Delicious Coconut Milk Frozen Organic Minis are the perfect little snack to satisfy that sweet craving. The texture is smooth and creamy, and the taste is sweet and rich! I was so happy to find these – my whole family can’t get enough of them! Make sure to check out their website to see where to buy them and to download coupons! it’s about time, they are so good! Do they have a strong coconut taste? No, not strong, but there is a hint of coconut flavor.